Va Pansiero means to have the “wings of gold” which perfectly reflects the high expectations set by the restaurant for halal Italian food. Jam packed in one tiny car, my family and I ventured into Radlett until we found the precious jewel sitting in between an array of traditional high street businesses. 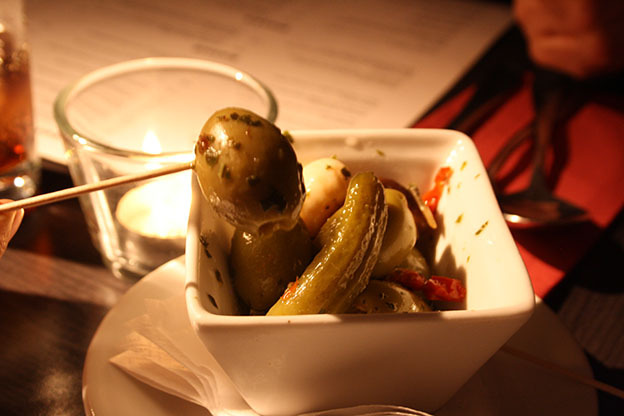 The dim, cozy, and family-friendly atmosphere is rather welcoming and you instantly feel comfortable and at home. 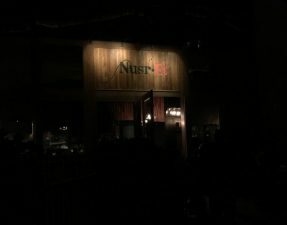 It was definitely the perfect atmosphere for a quiet night out with the family. Just a quick warning before you read on… the picture quality in this post is awful (yup, guilty of using my smartphone) which is pretty upsetting seeing as I really want to show you guys just how delicious each dish looked! A bowl of mixed garlic and pickled olives dripped in tangy olive oil was enough to keep our hunger at bay as we waited for the soft, buttery slab of garlic bread. It was devoured so fast that we insisted on ordering another portion pronto! 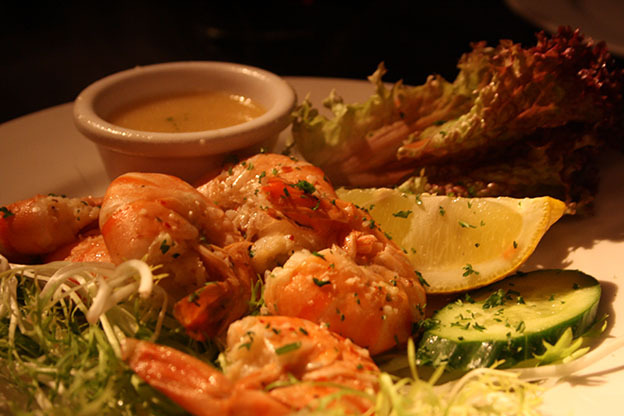 Prawns with hot dripping melted butter. The dressing prevented a usual fishy taste of the prawns but was also not too overpowering. Just look at this monster dripping in just the right amount of creamy mushroom sauce. 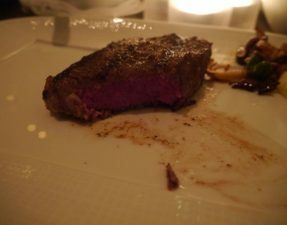 Cooked to the perfect medium-well, this steak was hard to resist and I devoured every single bite of it. 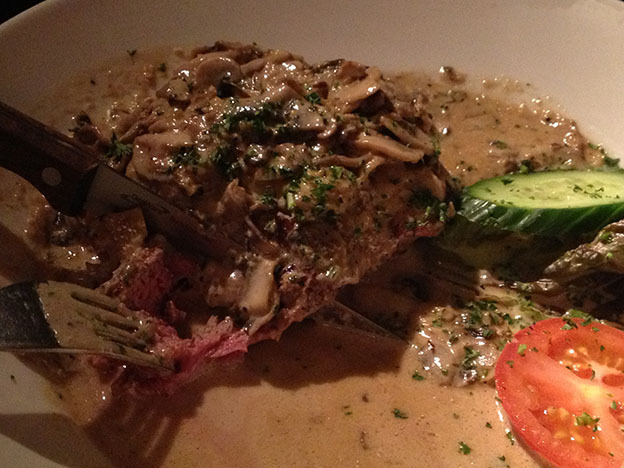 It was flaky, soft and juicy – definitely one of the best steaks I’ve had. 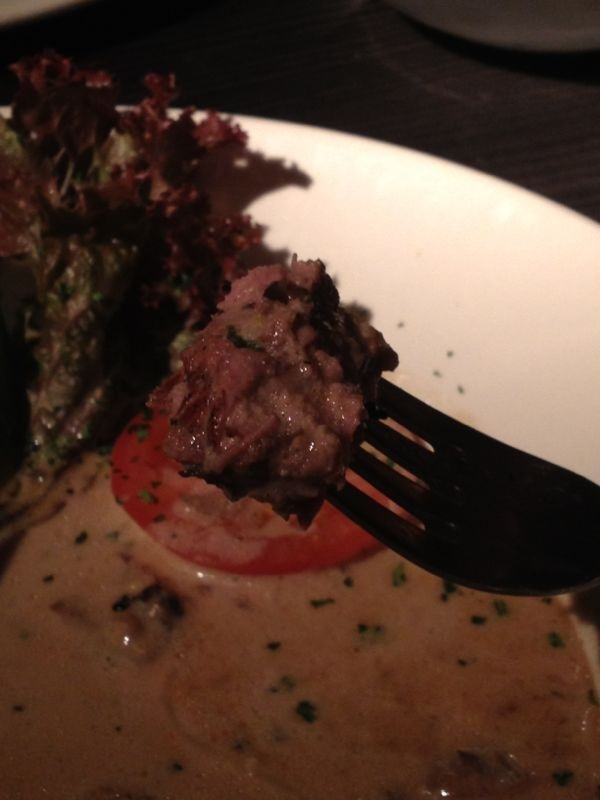 You can tell I loved it… I got way too iphone-trigger-happy with this steak. Deep fried chicken escalope in bread crumbs – this would be one to make the colonel jealous. The chicken was moist in which the bread crumbs soaked up all the juiciness without making the outer layer soggy. It tasted even better with a spoonful of marinara sauce, which I recommend ordering on the side if going for this dish or the veal escalope. For those who shy away from red meat, this dish is perfect for you. A mountain full of tomato pasta in which I just couldn’t stop poking my fork into accompanied the chicken escalope. 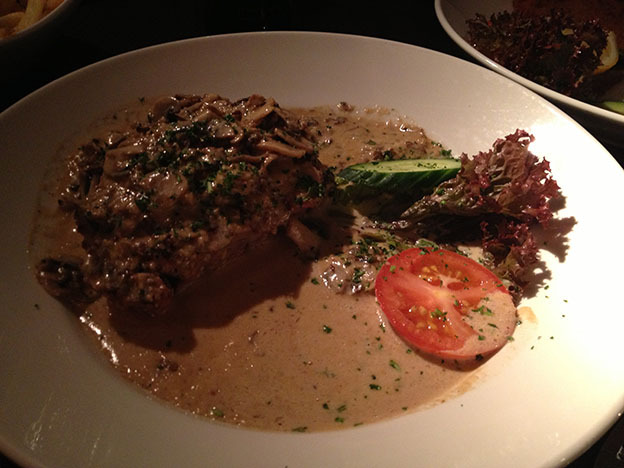 Mum opted for the Vitello Alla Milanese cooked well done – in other words, deep-fried breaded veal escalope. 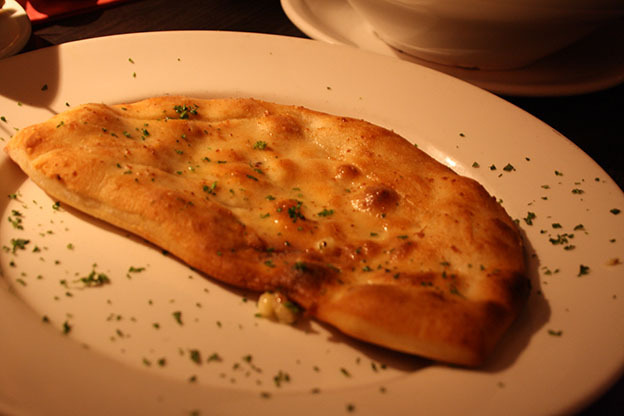 It came overhanging the plate and was thin and crispy, but was slightly dry. 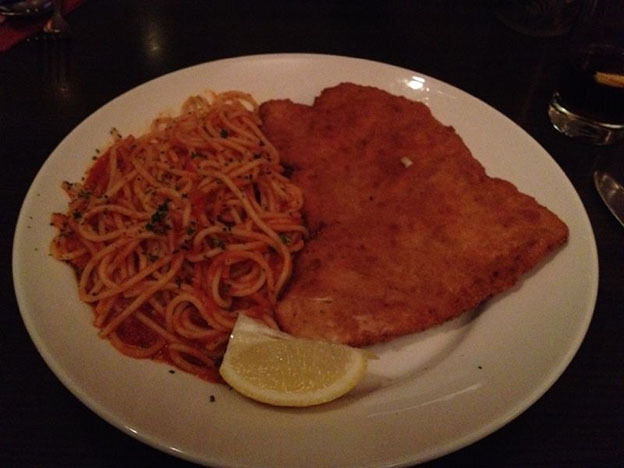 Alas, not to worry, this is where the juicy tomato spaghetti side complemented the fried crispy crust of the veal. 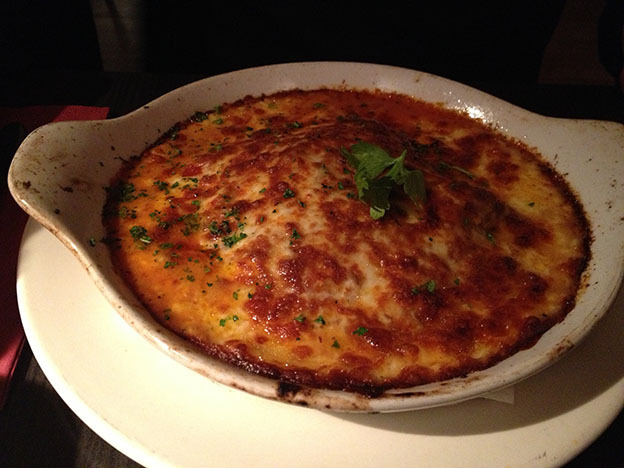 Just look at the crisping and bubbling of the cheese on the surface of this beef lasagne. Oh sweet cheesus. It had the perfect amount of chunky flavourful beef Bolognese, soft doughy pasta, and smooth white sauce – outrageously tasty! 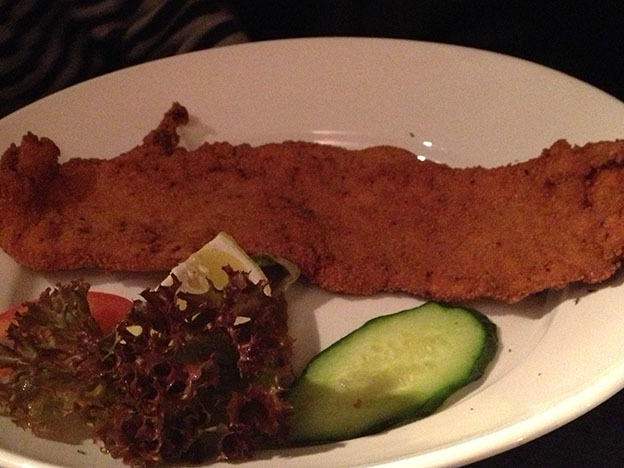 Both the veal & chicken escalope, and the steak, came with an array of sides to choose from; pasta, vegetables, salad or fries. The fries had just the right amount of crispiness with sprinkles of parsley adding even more flavour to the carefully cut fries. Please be aware that these photos do not do justice regarding the SIZE of the dishes – the portions are overly generous! We left Radlett’s version of little Italy with that warm fuzzy feeling you get after eating a good meal. I can’t recommend this place enough for good hearty Italian just like mama used to make! 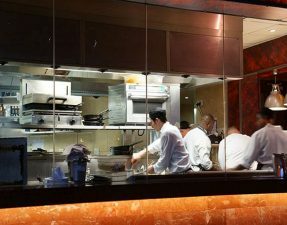 – Halal status on lamb, beef, and chicken verified by restaurant. I checked and only their chicken is halal :(. How sad. Hi there. Always a pleasure reading your blog and i’ve visited many of the restaurants which you reviewed. Very well recommended indeed. But some reviews do not have the approximate prices 🙂 would be great if you could update us for this italian restaurant. Thanks.